Most Indian sculpture is religious, the expression of the divine in visible form. 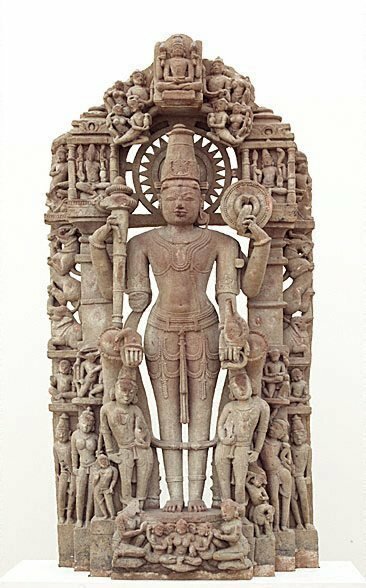 The Chandella artists who sculpted this majestic sandstone image of Vishnu, one of the most powerful and popular gods in the Hindu pantheon and the preserver of universal order, were supreme workers of stone in medieval India. Vishnu is attended on either side by his avatars or incarnations, including the boar-headed Vahara and the man-lion Narasimha. Lesser attendants and narrative detail fill the rest of the skilfully carved surface, stepped back in four planes. As usual, Vishnu is depicted standing in a full frontal pose, wearing the crown of the warrior aristocracy and with the sacred thread looped across his bare chest. In three of his four arms he holds one of his principal attributes: the mace ('gada'), discus ('chakra') and conch ('sankha'). Sometimes his fourth hand carries a lotus ('padma') but in this example his fourth hand is held in the symbolic gesture ('mudra') of boon-granting ('varada'). His bolt-upright stance identifies him with the axis of the universe, while his vertical emphasis leads the worshipper's eye upwards to the divine. 'Asian Art', AGNSW Collections, 1994, pg. 176. A key sculpture in the gallery's collection is this stele of Vishnu dating to the Chandella period. Iconographically complex and technically sophisticated, sculptures such as this covered the entire structure of a Hindu temple. In this stele the figure of the central deity wears a tall crown and is depicted with a square face, broad shoulders, narrow waist and tapering limbs. The deity’s body is stylised and smooth, not defined in any way by the muscles or skeletal structure of his anatomy, yet displaying a firmness, naturalism and vitality. The identity of the deity is defined by jewellery and ornaments - crown, earrings, bracelets, necklaces, waistbands, leg drops and so on. This interest in the decorative treatment of sculptural forms reached its zenith during this so-called ‘medieval’ period of Indian art, but despite this artistic zeal sculptures always conformed to the iconographic conventions outlined in the various technical treatises on Indian image-making. Vishnu holds his distinguishing attributes - the mace, the wheel ('chakra') and the conch shell. These represent the powers of the god and describe the deity as the embodiment of divine justice: the conch symbolises sound as the origin of Creation, the wheel symbolises the cosmic law, the mace, the power of the cosmic law. Immediately to either side of the central figure are Vishnu's attributes of the conch and wheel personified as celestial beings. The surrounding figures represent Vishnu’s ten avatars. The Asian Collections, AGNSW, 2003, pg.18. 110.0 x 55.0 x 24.5 cm; 142 kg. Jackie Menzies, AGNSW Collections , 'Asian Art - India, South-East Asia, China, Tibet, Korea, Japan', pg. 173-228, Sydney, 1994, 176 (colour illus.). Haema Sivanesan, Art in Education 1999-2000 , 'The body in Hindu art: a sandstone sculpture of Vishnu with attendants at the Art Gallery of New South Wales', pg. 36-37, 2000, 36, 37 (illus.). The Asian Collections Art Gallery of New South Wales , 'The Realm of the Hindu Gods', Sydney, 2003, 18-19 (colour illus.). The colour illus. on page 19 is a detail of this work.